Barrie shares a new single taken from their upcoming LP "Happy To Be Here"
Today Barrie have announced details of their debut album and UK live dates in April. ‘Happy To Be Here’ will be released on May 3rd via Winspear and the lead single “Clovers” is online now. 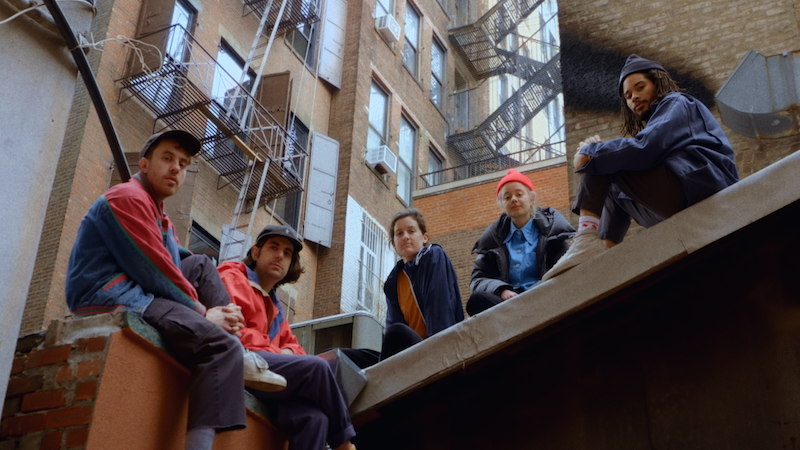 Inclusivity is at the heart of Barrie, the Brooklyn five-piece made of Barrie Lindsay, Dominic Apa, Spurge Carter, Sabine Holler and Noah Prebish. And on their debut LP ‘Happy To Be Here’, their multidimensional take on classic pop sounds awake and present, like a group that’s daydreaming but firmly there with one another. Lindsay largely wrote these songs late into the night, alone in her apartment, and her voice feels appropriately full of possibility throughout. Barrie, the band, is primarily her project; on the record, which she co-produced with Jake Aron (Snail Mail, Solange, Grizzly Bear), Lindsay plays guitar, piano, synth and bass. But still, Barrie is distinctly not a solo project, and ‘Happy To Be Here’—out May 3, 2019 via Winspear—is very much a full band record. Dominic’s drums fill the entire album, while Noah added synths and Spurge sang on nearly every track; the three also contributed production. And Sabine, though stuck in Germany with visa issues, remotely recorded vocals. Engineered and mixed by Aron at his Brooklyn studio in August 2018, the album is a softly explosive document of Barrie’s collective vision: “a well-crafted pop song that’s a little bit fucked up,” they explain. The album’s singles speak to its scope: the analog synths that burst from piano pointillism on “Clovers”, the lush electric guitar grooves on opener “Darjeeling”, the minimal arrangement and modular programmed drums of “Saturated”. Happy To Be Here’ will be released on May 3rd via Winspear. PRE ORDER: HERE. CATCH BARRIE PLAY AT MOTH CLUB ON THE 26TH APRIL. TICKETS AVAILABLE HERE. BARRIE PLAYING THIS FRIDAY AT MOTH CLUB!